NEW DELHI: The Indraprastha Apollo Hospital in New Delhi and a doctor have been directed by a consumer forum to jointly pay a compensation of over Rs. 10 lakh to the family of a woman for wrong treatment of a tumour in her head, leading her to undergo another surgery. South Delhi District Consumer Disputes Redressal Forum, presided by Justice N K Goel, asked the hospital to pay Rs. 10.5 lakh to the family members of Uttaranchal resident Chanda Devi, who died this year. It noted that the South Delhi hospital had wrongly conducted an operation to remove the tumour from Devi’s head in 2002 and, after suffering for two years, she had to undergo another surgery for the same ailment. “We have no hesitation in coming to the conclusion that it is a clear-cut case of deficiency in service on the part of Opposite Party-1 (hospital) and Opposite Party-2 (doctor who operated Devi),” the forum said, noting that “in fact the complainant (Devi) suffered a lot constantly”. “She was under treatment. The tumour was very much in the brain. Ultimately she has to undergo Gamma Knife Radio Surgery in the VIMHANS Hospital. Under these circumstances, we are of the view that interest of justice will suffice if compensation of Rs. 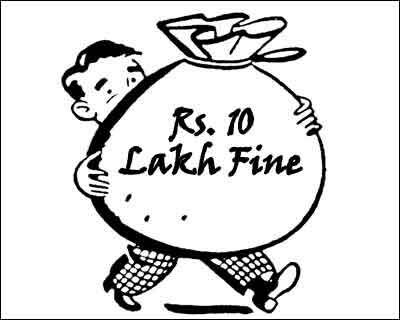 10 lakh is awarded to the complainant…plus litigation expense of Rs. 50,000,” it said. The forum further said 80 per cent of the amount shall be paid by the hospital and the rest borne by the concerned doctor. According to the complaint, Devi was admitted to the hospital in September 2002 as she was suffering constant headache for around nine months. She was suggested to undergo an operation due to the tumour. However, instead of removing it, the area of the tumour was suppressed in the operation, it said. After some time, the tumour erupted again causing her more headache. The hospital claimed there was no tumour in her brain and suggested some medicines, the complaint claimed. It said Devi took the medicines for two years but as there was no relief, she had to be admitted to the other hospital in 2004 which confirmed the presence of the tumour and was operated upon there. Thereafter, Devi’s family members approached the state consumer commission seeking Rs.42 lakh as compensation. The state commission referred the complaint to the district forum. The hospital and the doctor concerned have denied any deficiency on their part. also physically after exploit then kill the patient. The judge by and large thinks that he knows ALL and aligns himself with the underdog. Such cases must have the opinion of a jury which should have neurologist/ neurosurgeon on the panel. Our law needs amendments. HoPe in India we (doctors) need the Judge who was at least a qualified doctor to deliver justice. ..